To use this first direct Banking on the go app you need to be a first direct customer and registered for first direct Internet Banking. We know that you like to manage your money when you're "on the go". That's why we've created this app. It allows you to see and use some of your Internet Banking services more easily on a smaller screen. Our app allows you to: • view balances and up to your last 90 transactions • make transfers between your accounts with us • make payments to a person or organisation you have paid before using Internet Banking At the moment, we are unable to offer our recently launched Digital Secure Key with this app. 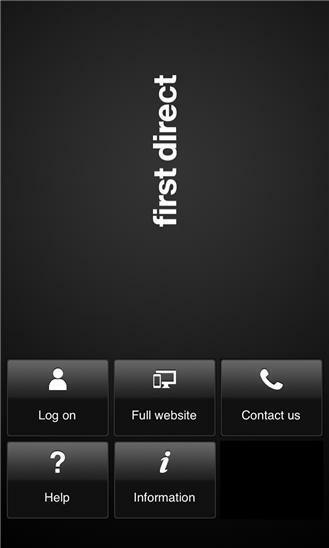 You can access the app with your first direct Internet Banking logon details. You'll still need to log on to full Internet Banking at firstdirect.com regularly to access all services. We recommend you do this at least every 14 days. Some of the Internet Banking services that you can only access by logging on at firstdirect.com are: • full statement information • details of monthly charges, fees and interest • sending, receiving and viewing secure messages • setting up payments to a person or organisation you haven't paid before • cancelling or amending a payment you have set up We don't charge you for this app, but we can't say the same for your network provider, who may charge you for downloading and using the app. You'll be responsible for these charges. We recommend that you don't use this app abroad, but if you do, you'll need to make sure that it's permitted by local law, and remember your network provider's charges may be higher. The app may be withdrawn at any time; we will tell you if this is going to happen. 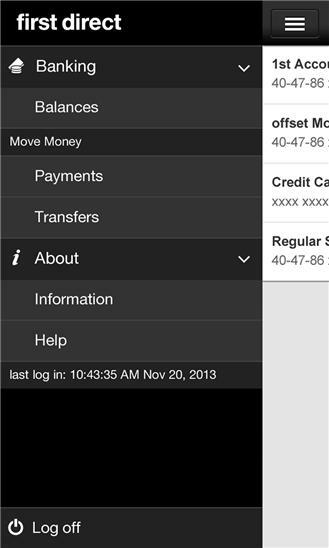 • Bug fixes If our app helps you to manage your finances, please post a review to let other customers know. Thank you.